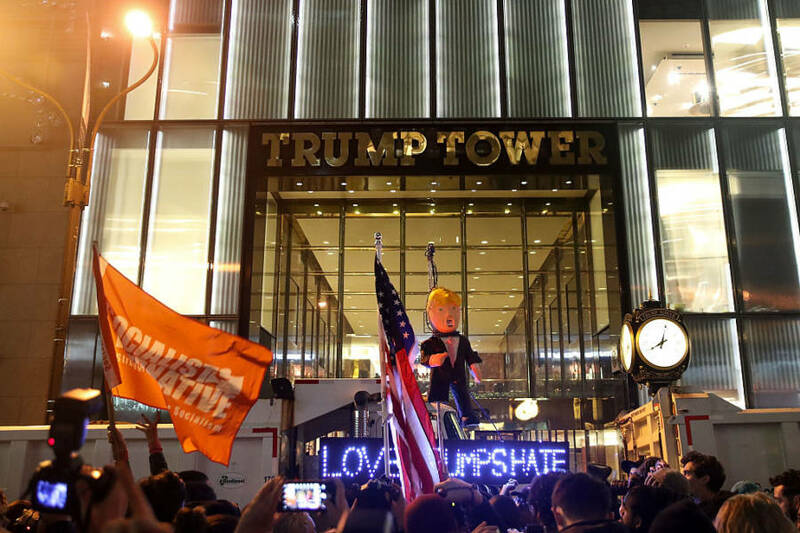 Other chants included "Black Lives Matter," "My Body My Choice" and "F*ck Donald Trump." 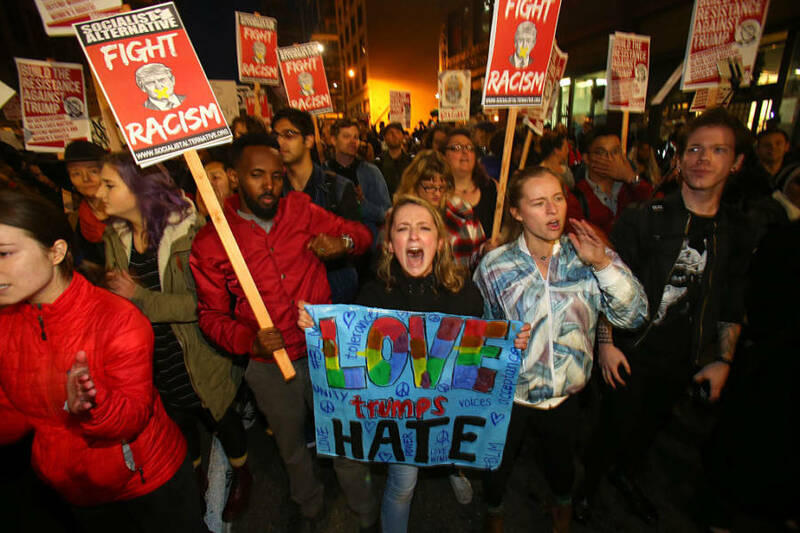 Millennials took to streets across America last night in protest of the ideals of the recent president-elect, casino owner and reality TV star Donald Trump. 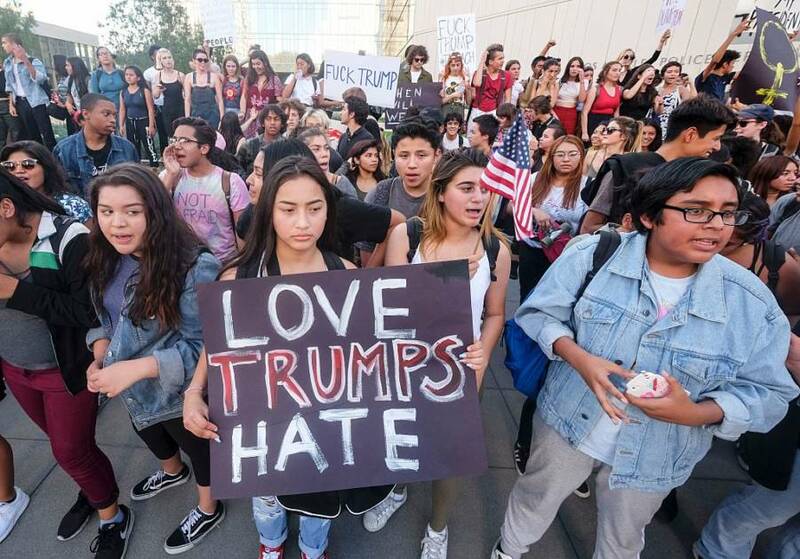 The Los Angeles rally was one of the largest in the nation, with protesters shutting down Highway 101 and burning an effigy of Trump at City Hall. 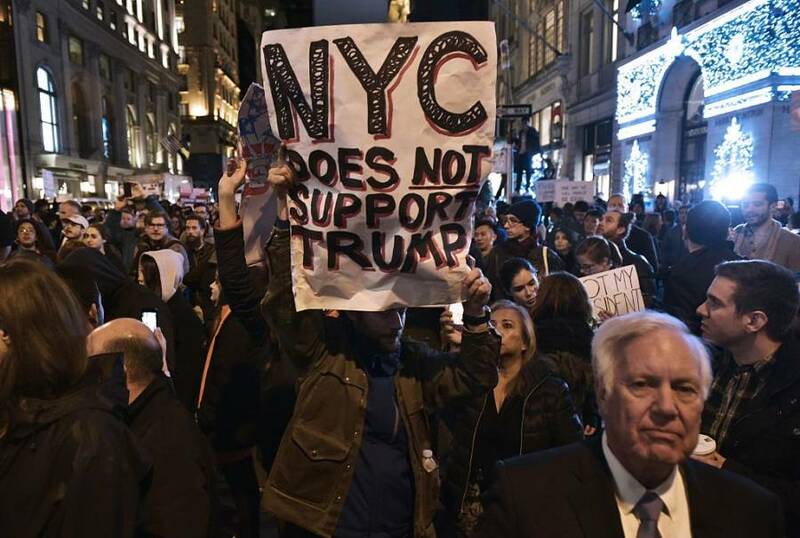 Protesters in New York City and Chicago also shut down major thoroughfares, bringing traffic on 5th Ave in New York and Lake Shore Drive — an eight-lane expressway beside Lake Michigan in Chicago — to a complete standstill. Many vehicles stuck in traffic seemed to encourage the protesters, however, honking horns as they walked past cheering. 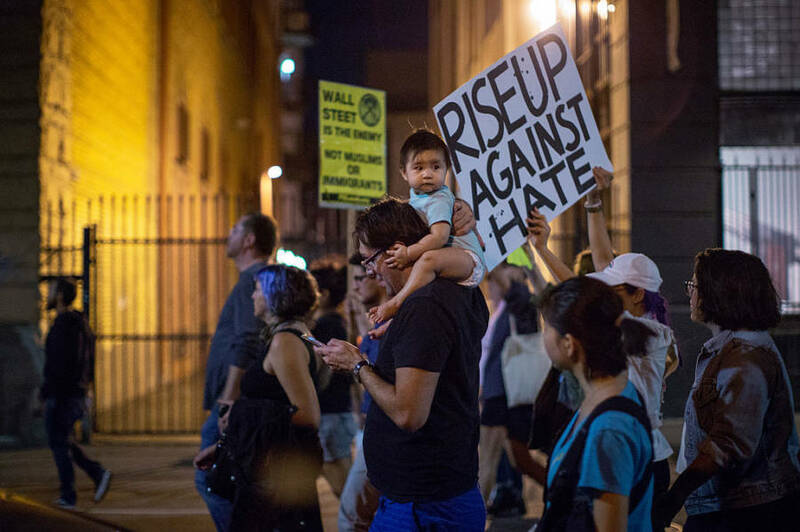 While the rallies were largely nonviolent, police arrested dozens of the more active protesters across the nation. 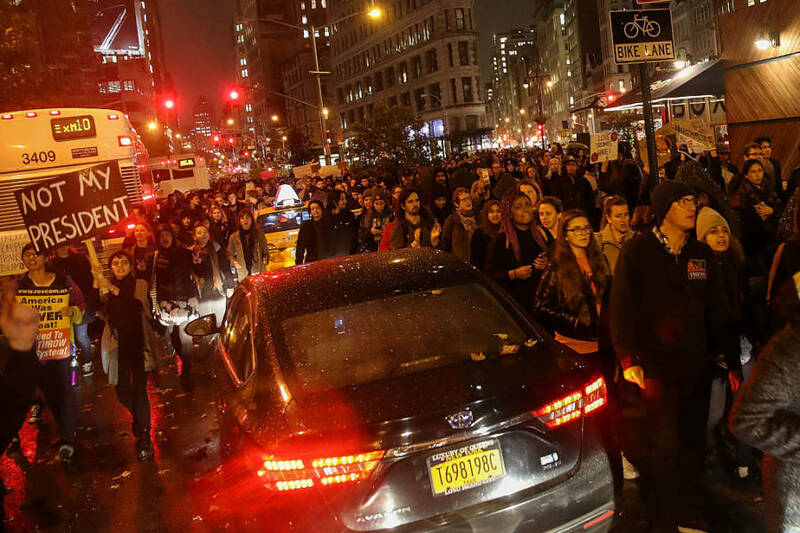 NYPD used loud speakers to warn protesters they would arrest them if they didn’t immediately get off the streets, but crowds zigzagged around police lines and used the heavy traffic to make themselves inaccessible. NYPD eventually parked loaded dump trucks around Trump Tower to ward off separate waves of marching youth coming in from Columbus Circle (north) and Union Square (south). 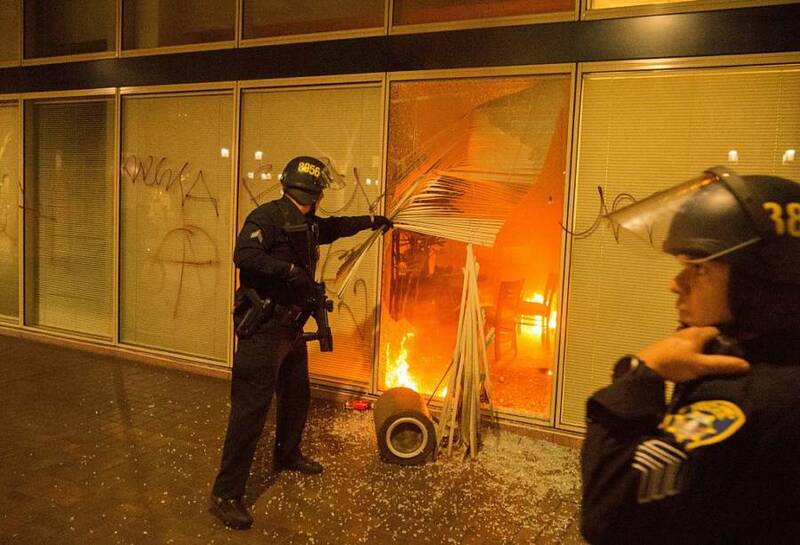 A similar situation occurred in Chicago, where protesters used the city’s iconic alleyways to break police lines. 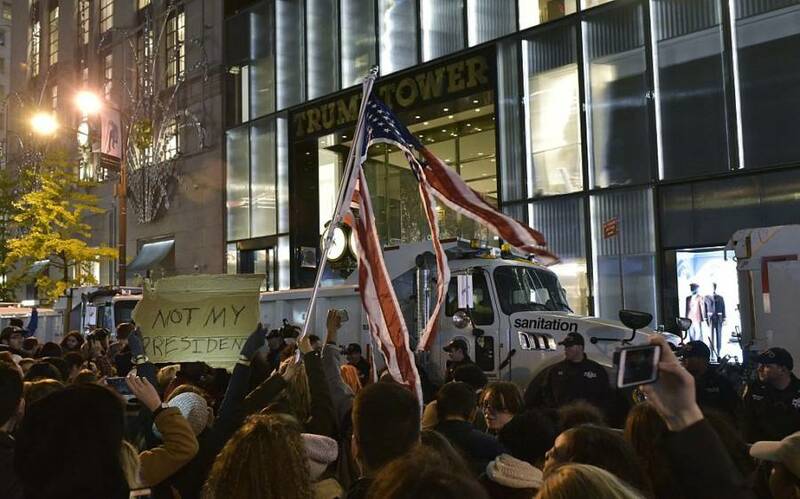 They eventually reached Trump Tower holding signs reading, “I still can’t believe I have to protest for civil rights,” before climbing on buses roofs to continue protesting, CNN wrote. 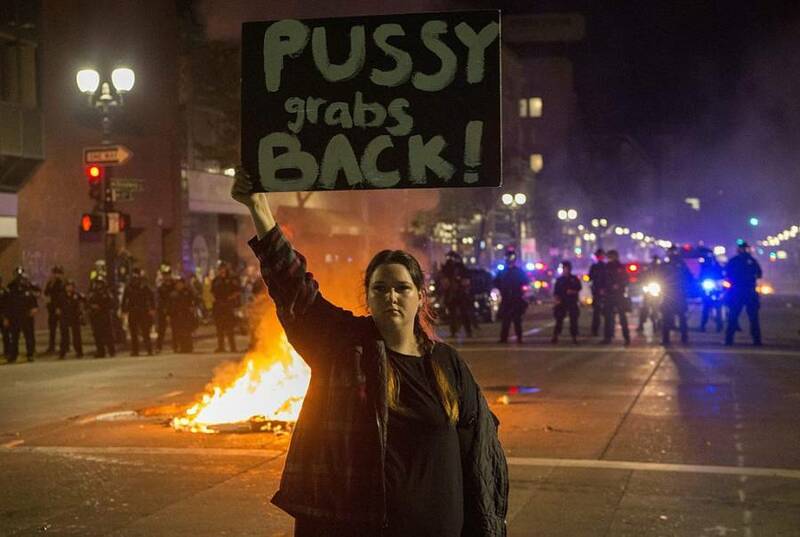 The protests occurred largely in cities with high Democratic populations such as Atlanta; Austin, Texas; Boston; Denver; Philadelphia; Portland, Oregon; Oakland/San Francisco and Washington D.C.
JOSH EDELSON/AFP/Getty ImagesA protester holds up a sign near a burning trash fire and a police skirmish line in Oakland. 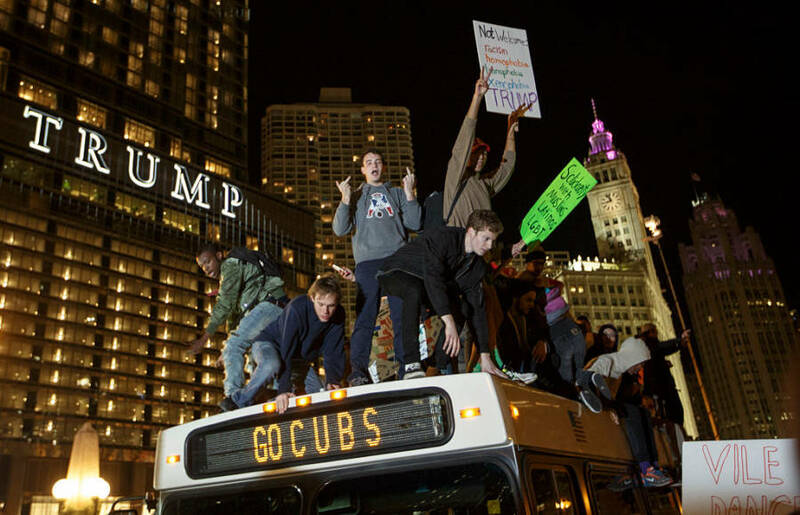 John Gress/Getty ImagesDemonstrators protest on top of a bus outside of Trump Tower in Chicago. 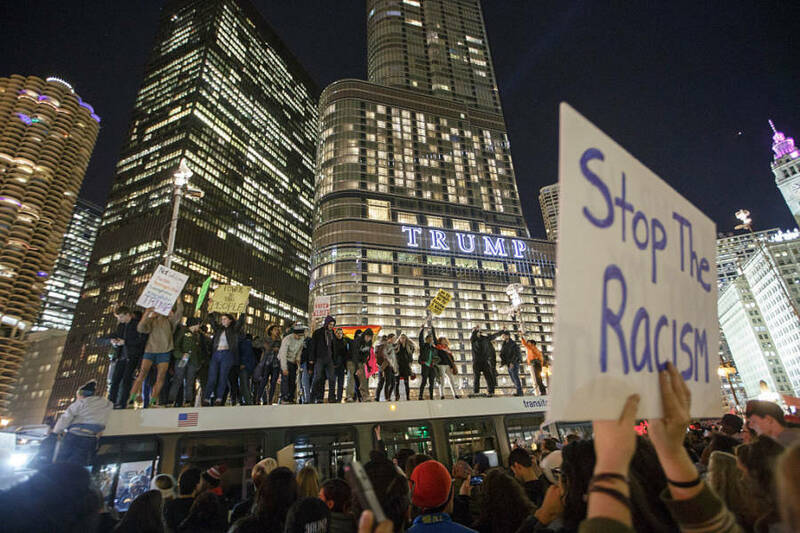 John Gress/Getty ImagesOutside of Trump Tower in Chicago. 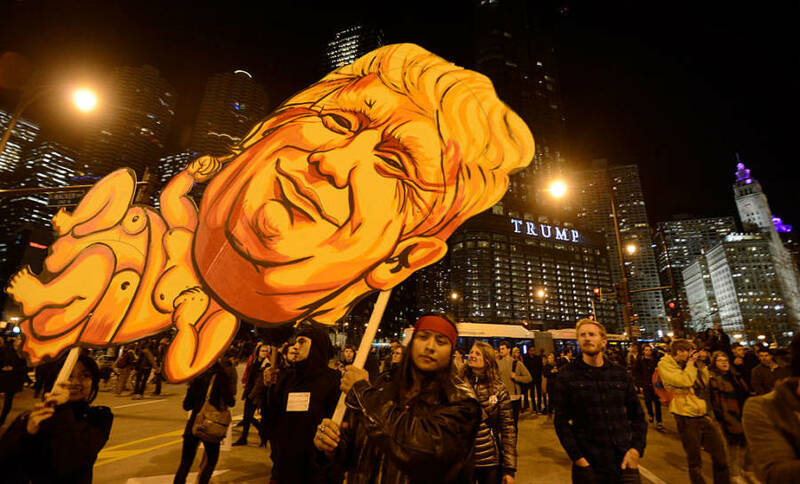 PAUL BEATY/AFP/Getty ImagesNear Trump Tower in Chicago. David McNew/Getty ImagesPeople in Los Angeles march in protest. RINGO CHIU/AFP/Getty ImagesDemonstrators rally outside Los Angeles City Hall. 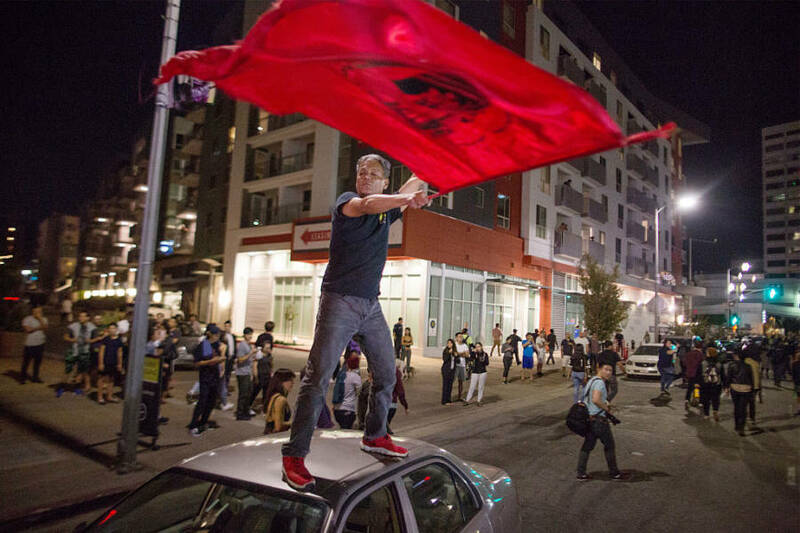 David McNew/Getty ImagesA man waves a flag from atop a car in Los Angeles. 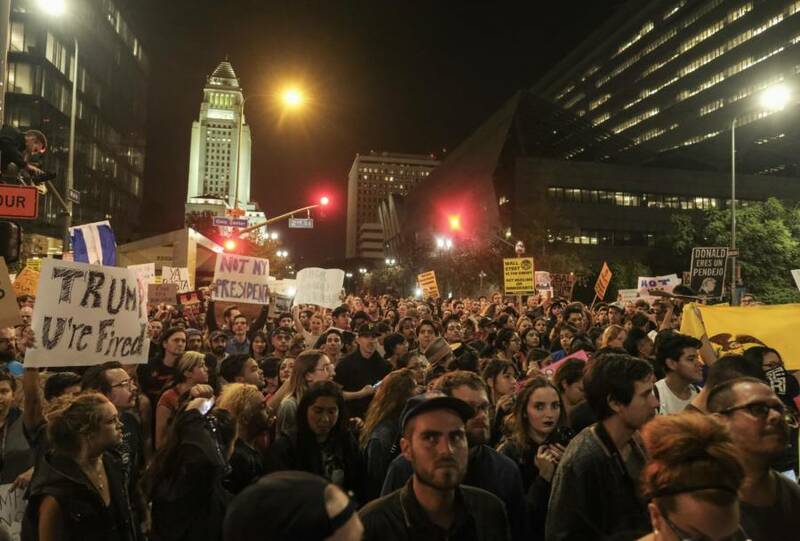 RINGO CHIU/AFP/Getty ImagesOutside Los Angeles City Hall. 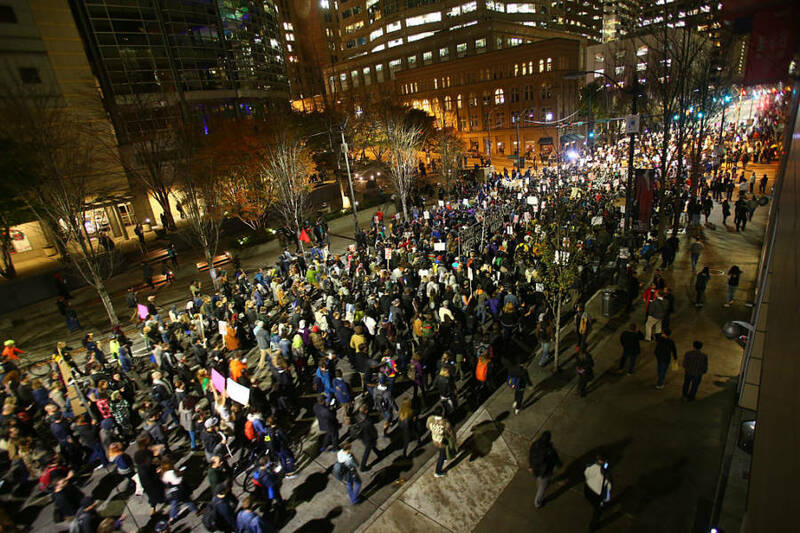 Karen Ducey/Getty ImagesThousands of protesters march down 2nd Avenue in Seattle. Karen Ducey/Getty ImagesA student at the University of Washington joins thousands of protesters in Seattle. 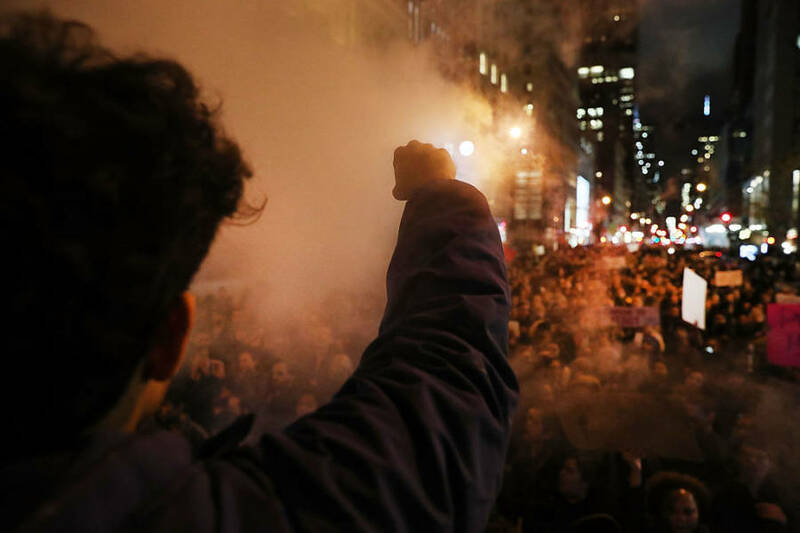 Spencer Platt/Getty ImagesProtesters shut down 5th Avenue In New York City. 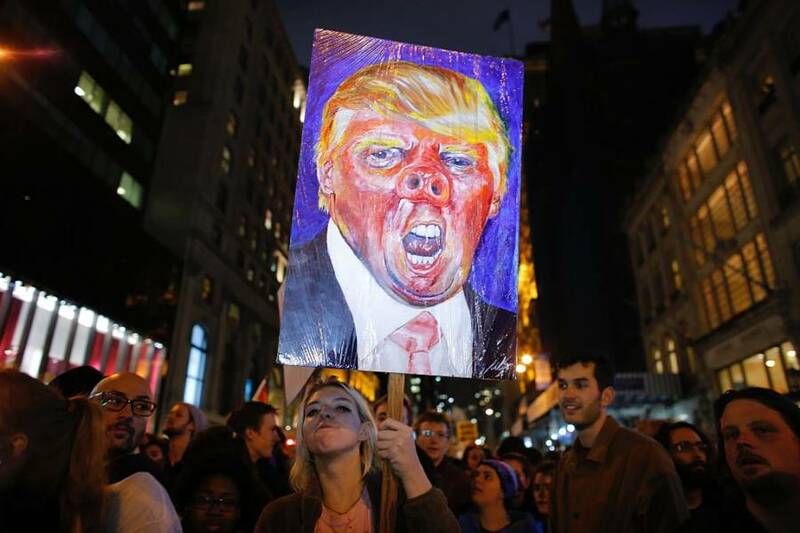 KENA BETANCUR/AFP/Getty ImagesA woman holds a poster as she takes part in the protest in New York City. MANDEL NGAN/AFP/Getty ImagesA protestor holds a placard on 5th Avenue in New York City. 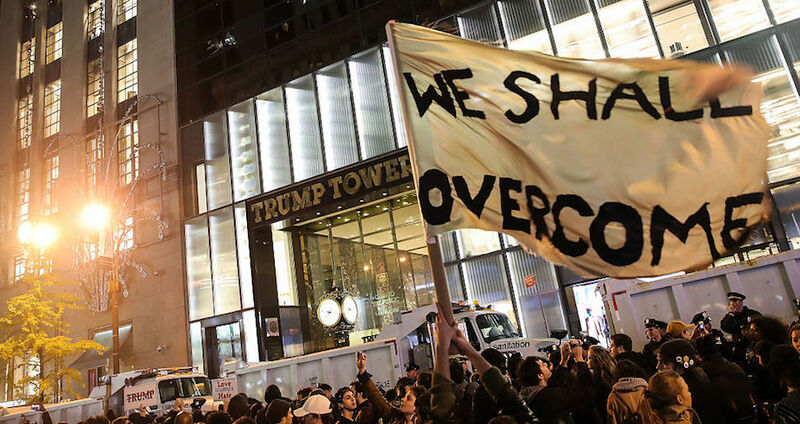 Drew Angerer/Getty ImagesProtesters marched through traffic on Broadway on their way to Trump Tower in New York City. MANDEL NGAN/AFP/Getty ImagesProtesters brandish a tattered US national flag during a demonstration on 5th Avenue across from Trump Tower in New York City. 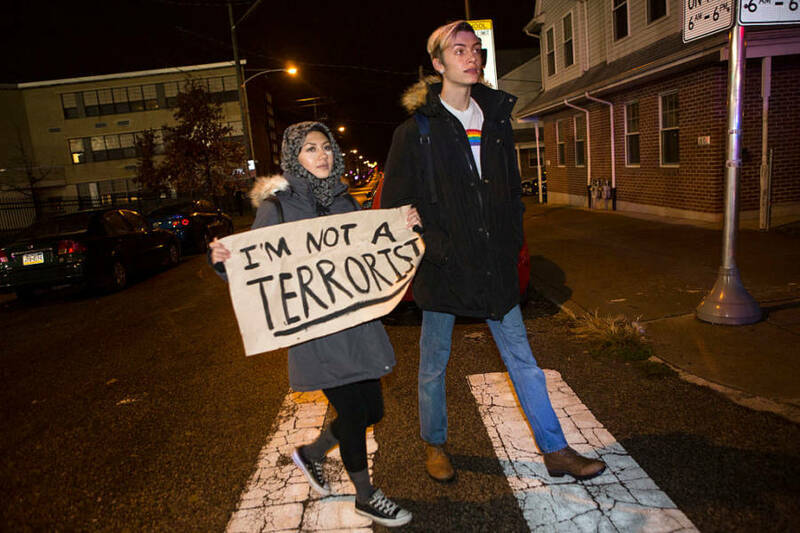 Jessica Kourkounis/Getty ImagesPeople march in the streets in Philadelphia. 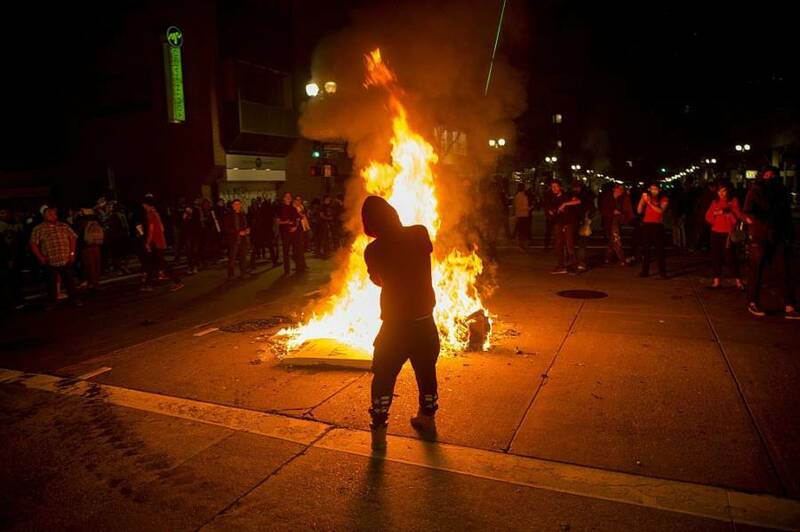 JOSH EDELSON/AFP/Getty ImagesPolice investigate a fire lit by protesters during an anti-Trump protest in Oakland. 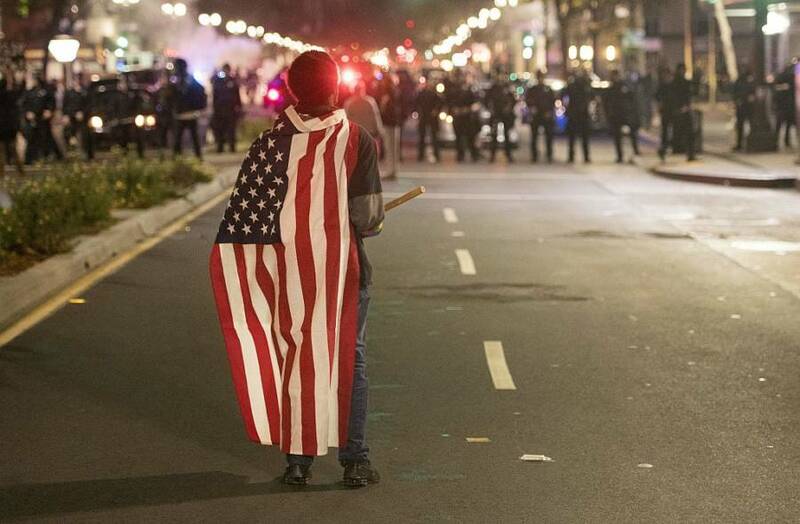 JOSH EDELSON/AFP/Getty ImagesA protester wearing an American flag faces police in Oakland. 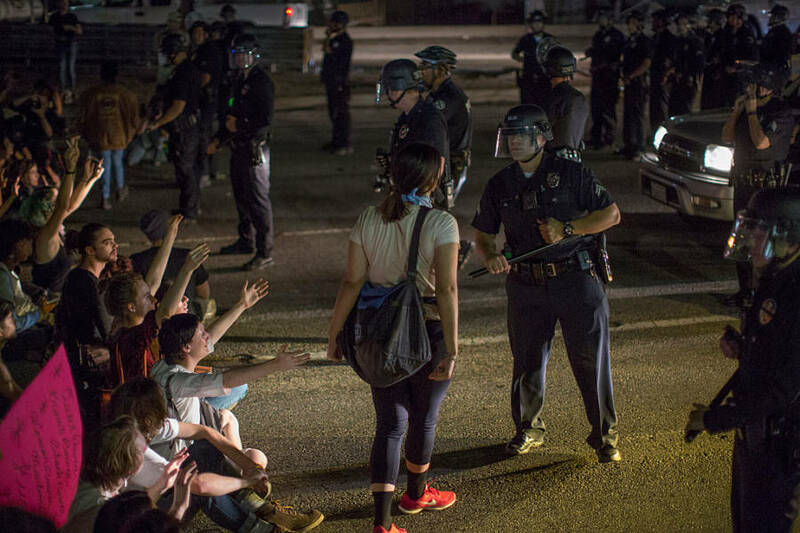 David McNew/Getty ImagesA woman yells at a police officer as protesters shut down the 101 freeway. JOSH EDELSON/AFP/Getty ImagesA man sprays lighter fluid on a burning trash fire at an intersection during an anti-Trump protest in Oakland. 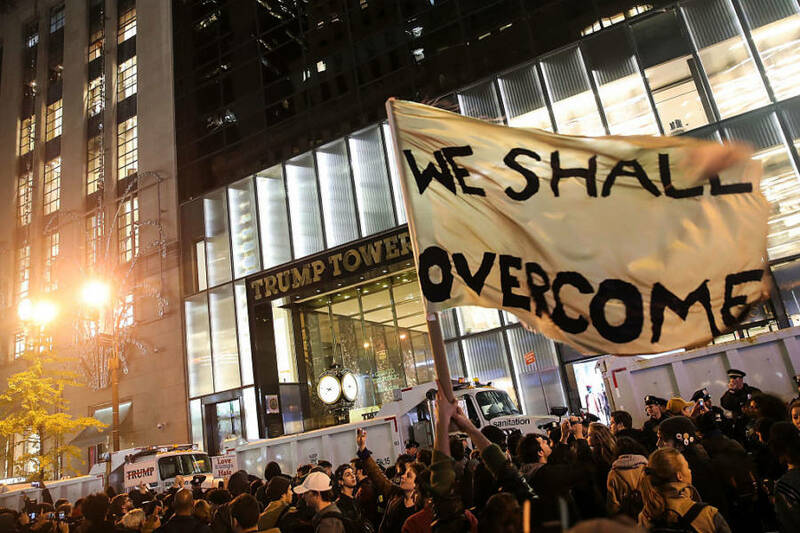 Drew Angerer/Getty ImagesThousands of protesters gather outside of Trump Tower in New York City.